Pulut Hitam – Black Glutinous Rice with Coconut Cream. Pulut Hitam is made from black glutinous rice sweetened with brown palm sugar. A surrey of creamy coconut milk is swirled over the Pulut Hitam before it is served. Boil both types of glutinous rice in water with pandan leaves till cooked. Add more water if necessary. When rice is cooked, add sugar and cook under low heat till sugar dissolves. Remove pandan leaves. Add salt and corn flour mixture mixing well. 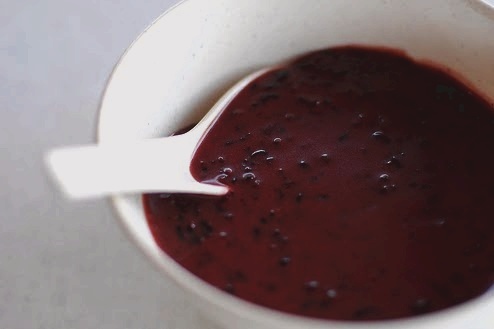 Cook coconut cream and low fat milk with a little salt and serve separately with the bubur pulut hitam. Think you mean "a slurry of creamy coconut milk", rather than "surrey".